Yellow jackets are a type of social wasp, belonging to the family Vespidae. These insects have black and yellow bands along their bodies with white or yellow faces. Although reproduction occurs in various habitats and locations, the different species of yellow jackets build their nests in a similar manner. 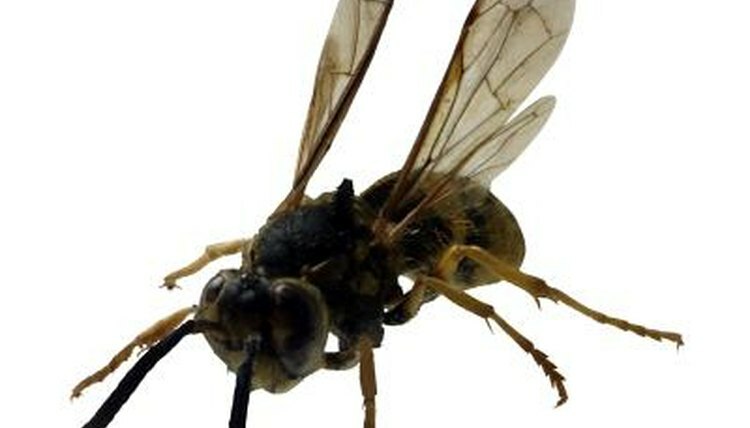 Yellow jackets are found worldwide. They're very common in North America, especially in southeastern states. Yellow jackets are generalist species, meaning they happily build nests in numerous environments. They're incredibly adaptable, living in rural, suburban and urban settings. Yellow jackets prefer habitats such as forest edges, meadows, grasslands, farms and city areas. Yellow jackets are nest builders. Old queens and colonies die off in late fall, while newly fertilized queens prepare to overwinter. They search for a warm place to live, such as in leaf litter, underground or in old logs. After hibernating over the winter, a queen yellow jacket, such as the eastern yellow jacket or southern yellow jacket, builds a nest underground in abandoned rodent burrows or in crevices of old stumps. Nests are often hard to find, although you can sometimes see these insects flying in and out of a small hole in soil. Some yellow jackets, like the German yellow jacket, build their nests around man-made structures like in sheds, structural walls and attics, although this is not as common as nests built in natural substrates. Yellow jacket nests are constructed of pulp. Common sources of pulp include wood fibers, plant stems, paper, string and caterpillar cocoon silk. These materials are chewed up and mixed with the wasp's saliva to make pulp. The fertilized queen wasp is the initial contributor to the nest's construction in late spring. She begins building the nest by forming a small disk made of pulp. She then adds a hollow shaft to the disk, attaching cells to this shaft. This is where she will lay her first bunch of eggs, which become worker bees. After raising these worker bees, she slowly takes over the role of just egg-laying, while her offspring take over expanding and maintaining the nest. Each nest can hold up to 5,000 wasps. If a yellow jacket nest is on your property, consider a few things before removing it. Yellow jackets are beneficial creatures for controlling insect pests like beetle grubs and caterpillars, as well as serving as a food source for animals like bears and skunks. If the nest is in a secluded area where people or pets do not frequent, consider leaving the nest alone. As winter comes, all of the yellow jackets in the nest will die off, and the nest weakens as it is ruined by the elements. If you have to remove the nest, consider hiring an exterminator -- especially if the nest is near or in your home.